Did you know it's world wide knit in public day soon? The knitting project I'm working on at the moment isn't summer-y at all - a cosy scarf in lovely soft grey "mega chunky" yarn. It's a great "instant gratification" project as the scarf knits up so quickly! Though I have frogged (unravelled) it twice so far as I kept knitting it too wide (it's ended up as only 10 stitches across). I've never used really chunky yarn before and I'm loving how it makes even the simplest of stitches look fantastic! That's a great picture. Just right. I bet your group are well pleased with it. I love big fat yarn! I knit year round too. My favorite fatty yarn is the Cascade Magnum line. It's super soft and comes in a zillion pretty colors. Wool of course. The best part is that you can whip out a scarf in short order and feel like you got something done! I love chunky yarn - especially the thick and thin stuff as it's so interesting and fast to knit with! Perfect for gifts not started in plenty of time! Hi! Thanks for letting me know about this! 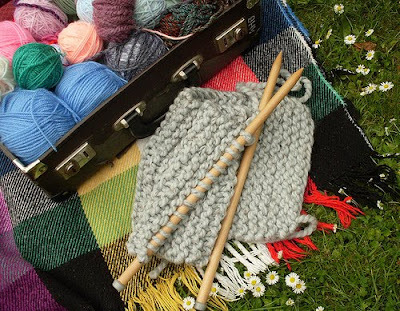 The photo of the chunky knit scarf in progress is so cool. I hope you enjoy your day, I'm thinking of joining a group too.